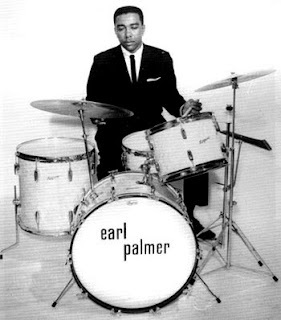 Today, I won't be recapitulating the life and times of Earl Palmer, who passed away on September 19th, just over a month shy of his 84th birthday. If you want to find out more about the man, there are some good to great internet resources that will at least get you started. His Wiki bio, a nice feature on the Dummerworld site (including some audio and video), and a memorial site are out there. Then, there is the incredible Dave the Spazz’s WFMU tribute show (3 hours of music!) from last month that should be required listening – planet-wide. Also, almost 10 years back, Earl's story, Backbeat, written by Tony Scherman, was issued. I highly recommend it for insight into this consummate professional musician, with plenty of direct commentary from Earl, plus an overview of his truly amazing career. For more links, see the end of this post. What I want to do here is focus on a just a few examples of his playing that demonstrate the more poly-rhythmic aspects of his style and express the uniquely New Orleans side of this incredible groove-maker. A deeply funky feel seems to be an innate characteristic of the city's best drummers, so ingrained in the local culture that to second line is second nature. With antecedents going back several hundred years through the Caribbean (Cuba and Haiti) to Africa via the tragic diaspora of slavery, that rhythmic heritage was perpetuated in the weekly dance and drum circles allowed in Congo Square and the secretive societies of the Mardi Gras Indian gangs in city. They arose in jazz, New Orleans' great improvisatory well-spring, through street parade musicians, moving on to shape the distinct local R&B flavor from the 1950s to the present day, as funk in the city’s music has become increasingly overt. Excuse me for trying to cram several centuries of musical ferment and evolution into a few sentences. Anyway, I don't think it's an overstatement or simplistic to say that Earl Palmer is a vital part of that musical continuum and the first drummer to inject both second line syncopations and the turbo-charged, driving pulse of rock 'n' roll into the mass appeal popular music that quickly overtook much of the world, influencing myriad musicians and forever changing listeners' attitudes and expectations, getting backfields in motion across racial and cultural divides, and uniting us in universal worship of the beat. He played on an enormous wealth of well-known music - R&B, rock 'n' roll, and pop – both in New Orleans and after he moved out to Los Angeles in 1957 into the big time session scene. There's no way to capture all that Palmer accomplished (although Dave’s WFMU show comes close!). So, I've picked these three songs from the mid-1950s, when he was still active in New Orleans, that never cease to amaze me. I hope they’ll at least give a glimpse of Palmer playing complex, yet highly danceable grooves that have origins deep in the culture of his hometown. "When I was with Dave Bartholomew's band, the guys used to come down to New Orleans to record because I had that mixture of something I was never allowed to do as a kid in a parade band. . . It was a mixture of the bass drum beat that one guy was playing and the snare drum beat that another guy was playing. And not just the basic beat on the bass drum. They were playing syncopated things that were meshing with the snare drum. I tried to do that on a set of drums. . . with a little more up-to-date funky thing. - Earl Palmer, interviewed by Jim Payne in The Great Drummers of R&B, Funk & Soul. Mr. Palmer was far too modest in describing what he was up to as a session player in the early days of New Orleans R&B, the late 1940s to mid-1950s. If it had been that easy and obvious, everybody would have been doing it. Take, for example, his backing of Professor Longhair on his handful of 1953 sessions for Atlantic Records. Fess was notoriously hard on drummers, having a strong, idiosyncratic, percussive piano style that pushed a Latin feel into his left hand bass notes which intermingled with his knuckle-busting right hand syncopation of rolling and tumbling lines. It was a hard hitting, complex and highly rhythmic attack that included kicking holes in pianos. Keeping up with him made Smokey Johnson's fingers bleed during the "Big Chief" session in the 1960s! When Fess let that stuff loose, a straight beat or a standard shuffle on the drums would not work. Palmer had a keen rhythmic sense coupled with spontaneous creativity that allowed him to intuitively support and compliment Longhair's piano eccentricities. A perfect fit. No sweat. In 1972, when Professor Longhair was being discovered by a new generation New Orleans music fans, Atlantic released the New Orleans Piano LP compiling their sessions on him form 1949 and 1953. It is an essential album and was re-issued on CD in 1989. You can hear Palmer's work with Fess there on the classics "In the Night" (in rotation at HOTG Radio) and "Tipitina", the two sides of his Atlantic single #1020 from 1954, plus "Ball the Wall" and "Who's Been Fooling You", which were not issued back then. I've chosen the latter tune, because it isn't heard much. "Who's Been Fooling You" was probably not picked for release because the mix was off, with Fess' voice too loud in spots and the instrumentation too far back. As great an engineer as Cosimo Matassa was, not every take was a winner. There were only about three microphones for the entire band; and I'm sure Fess was a technical challenge to record any day. Still, you can hear his synergy with Palmer, even though the kick drum isn't discernible. It's a shame they did not do more together, as Palmer was Fess' best percussive accompanist, with Johnson, Uganda Roberts and Johnny Vidacovich also doing fine work in later years. But, the rock backbeat is not what Palmer was doing on “That Mellow Saxophone”. I did a previous post on this one in the early days of HOTG, and I stand by what I said. I'll just add that I don't think there is a better example of tight, incendiary ensemble playing in early rock 'n' roll. What is amazing about this tune is not only the flat-out energy generated by all involved, but the sheer difficulty of the intricate riffing and timing, which everybody just nails. The drum patterns? I don't know how to begin to describe what Palmer does here. It is higher order syncopation, off-kilter/inside-out, latino-swing-rock, and definitely off-the-hook. A lesser musician might have retired after that session, thinking it couldn't get better; but, for Earl Palmer, it was just another day at the office. We should not forget that the majority of top session players in New Orleans were accomplished jazzmen, including Palmer, who played R&B, rock, and pop because that's what paid the bills. While they certainly changed the game and raised the bar for playing popular music, that was not their conscious intent, but merely a byproduct of the chops they brought into the studio. When you think about these guys managing to condense an impressively arranged, big band type blowing session into an exuberant two and a half minute pop record, it's an amazing work of devious craftsmanship. I'm sure the fun they must have had making this one of a kind wonder was worth far more to them than the standard union scale they were paid for it. Finally, here's one more cut, also from a previous post, that is too good an example of Earl Palmer's talents to overlook. Paul Gayten recorded this radical re-working of his song, "For You My Love", in 1957, right around the time Earl Palmer left his hometown for good. This is one of my favorite Gayten tracks, because you hear Palmer mixing in some Afro-Cuban influence, which had been strong in the New York jazz and dance band scene for many years and also had antecedents in the musical development of the Crescent City, with those strong cultural connections to the Caribbean. As noted in my earlier post on this tune, Gayten had written and produced this song for Larry Darnell in 1949; and it was an R&B hit in that more straight ahead version. But later, he re-imagined it as a rock 'n' roll hybrid, which he recorded himself while working as Chess Records' A&R man in New Orleans. For some strange reason, it was never released, depriving the world of its addictive groove until it appeared on the Chess King Of New Orleans LP and CD. On it, Palmer superimposes a Latin beat on the bell of his ride cymbal over a syncopated New Orleans rock 'n' roll shuffle on the snare, creating a natural expression of the city's influences that can't help but engender dancing, revelry, and general getting it on. Gifted local drummer Charles "Hungry' Williams would also adopt a similar poly-rhythmic combination at various sessions, as he began to replace Palmer in the premier drummer's seat in New Orleans; but I think Earl was there first. Granted, this is a very personal and limited choice of evidence for Earl Palmer's Home of the Groove legacy. But that should be expected. There’s plenty more to discover about him for the musically adventurous; and I encourage you to go after it . In the middle of the last century, he came on the scene at the convergence of old and new approaches to rhythm, and created a synthesis of styles that is still reverberating in music. Now, it’s taken for granted, as if it has always been there. But Earl made it happen as it did, because the way he played was undeniable. He turned the world around and re-calibrated our molecular structure with a drum set and an irrepressible New Orleans spirit. After exposure to his up-to-date funky thing, we'll never be the same. Hi, jipes, I've never heard of Taj doing "That Mellow Saxophone", but it would be a great cover tune for him. Anybody know Taj well enough to suggest it - or to tell us if he's performed it live? I don't think he has recorded it. Hope that changes one of these days. By the way, Cyril Neville covered this tune on his New Orleans Cookin' CD - and Dr. John sang a live version of it on his Hollywood Be thy Name LP - speaking of cookin'. a chapter on palmer is included in max weinberg's BIG BEAT, a book on the 12 greatest drummers in the history of popular music . . . it's been in and out of print a few times. well worth the effort. thanks for all the great posts and knowledge!